What to do so your art looks amazing for years to come. When you buy something amazing, like artwork, you want it to stay brilliantly beautiful for a long time to come. With just a little TLC, your artwork can last for a lifetime – and beyond. Made with care and true craftsmanship. All original artwork, limited editions prints, and frames are made with only the highest quality materials. We believe that the details matter. Our frames are custom crafted with care by artisans who love what they create and take well deserved pride in the outstanding results. Sunlight is wonderful, but not for your artwork. Just like the ways sunlight is harmful to your skin with UVA and UVB rays, it is also harmful to your artwork. Natural reflected daylight is best. We want you to enjoy your artwork treasures - and to do that you need to see it! When choosing places to hang and enjoy artwork look for walls where direct sunlight doesn't shine. One of the better places to hang artwork is often on the same wall as any windows - this allows optimal natural reflected light for viewing artwork to fall gently on the work, without the worry of direct sunlight. Tip: Hang your artwork where it will be out of direct sunlight. Water Magic © Kristen Girard from the Goddesses and Gods Collection. Limited edition canvas prints are available framed and unframed in the Art and Stories Shop. Until you frame your print keep it in the protective, clear cover it came in. The cover will help keep moisture and dust away from the print while keeping it ready to look gorgeous once you are ready to frame your treasure. Canvas Prints: If you want to dust your art for any reason, a dry, clean microfiber cloth is a great way to go! Just gently wipe the art in a circular motion. Or you can use a dry, super soft bristled brush. Matte Paper Prints: The best option for dusting your unframed print is with a gentle burst of air or very soft bristled brush. Framed Art with Glazing: To clean dust from the outer frame use a clean, dry microfiber cloth. To free the glazing from dust a clean, dry microfiber cloth like you would use for a camera lens is best. For tougher dirt or spots –mist the clean, dry microfiber cloth only with cleaning solutions that are recommended for use on computer screens and camera lenses. Never spray any cleaning solution directly on the glass glazing or frame. Ammonia based glass cleaning solutions, such as Windex, are much too harsh to use around artwork. Tip: When choosing a brush to dust you print it should feel as soft as a kitten's fur on your wrist. Pro Tip: The safest place for artwork is framed and hung on your walls where you can enjoy it. Iguanodon © Kristen Girard from the Dinosaur Collection. Delightful dinosaur inspired art, decor, & gifts are ready to make your favorite dinosaur expert smile in the Art and Stories Shop. Glazing refers to the type of glass used in framing to protect art from dust and abrupt changes in humidity. Museum Glass: Simply put, Museum glass is ammmaaaaazing! 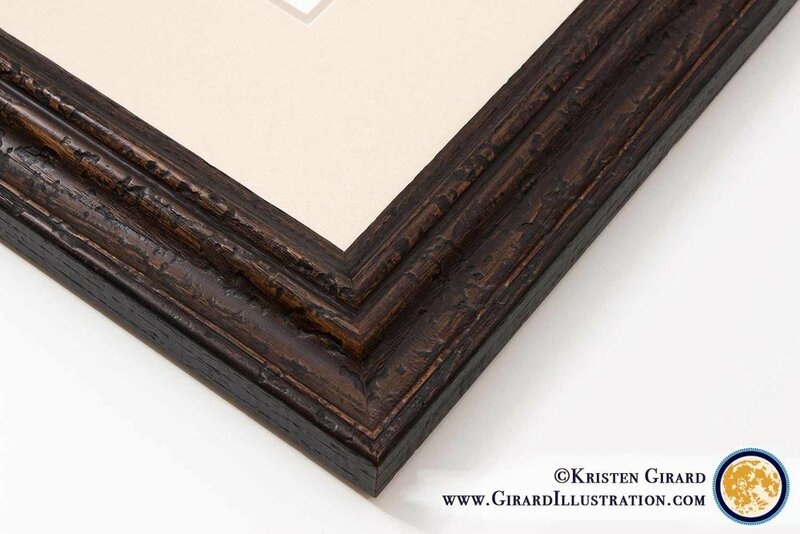 It is strongly suggested that your original art or giclée print be framed using Museum Glass. It's truly wonderful! Museum Glass will allow you to view the artwork at its best with very little to no reflections, which makes it far superior to standard glass. At the same time museum glass will help protect the artwork from the damaging effects of ultraviolet light, which will help your art look top notch for years to come. Tip: Museum Glass is so clear and reflection free that people often don't realize there is glass on the artwork at all! Pro Tip: When cleaning any framed artwork never, ever spray cleaning solution directly on the glass. Instead mist the cleaning solution on a dry microfiber cloth instead.